When you use this Professional Pet Shower Sprayer Bathing Massage Tool. It has a revolutionary massage scrubbing pad that penetrates even thick, long fur. Get your pet deep clean to wash away excess oil, dirt, grime, bacteria, and powerfully prevent skin disease that makes so many animals miserable. You'll see less itching, scratching, and biting for a happier, healthier pet. 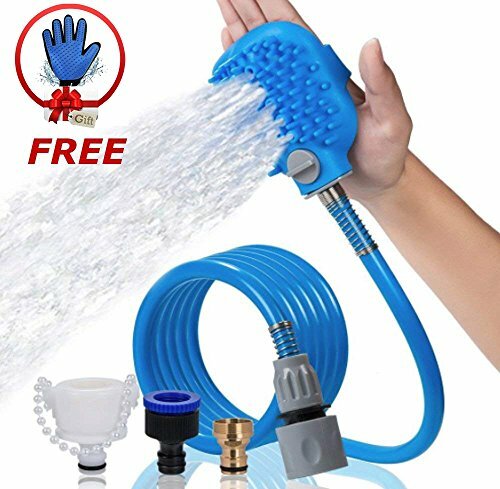 this dog shower tool comes with a massage glove and 8ft long pipe as well as 3 hose adapters, can be quickly connected to garden, house or shower. Shower spray header and grooming glove are designed as one, your pets can enjoy both shower and massage at the same time. Comfortable grooming glove and soft hose made getting under pet belly easy and massaging some of the dirt out with the brush like sprayer. After the dog shower, you can use the right hand hair removal gLove to comb him for preventing hair loss and keeping your pet tidy&clean. Cool her off during the summer with an easy and fun shower in your backyard, giving her a relaxing massage. ✅[Easy to Install]: first press down gray end of the sprayer&release your hand as soon as you connect the faucet adapter to it; then conect adapter to the faucet; buckle the shower head on your left hand, the hose will not drop because it is attached to your hand. ✅[UNIQUE DESIGNS]: Five finger design allows you to groom hard-to-reach places like face. Ergonomic design makes the dog water sprayer can be worn as a glove which allow you to control your dog with both hands while soaking the densest fur. ✅[INCLUDES 4 ADAPTER ATTACHMENTS]: 1/2 and 3/4 inch plastic adapters, hose adapter and 0.9 inch brass adapter. Please, use it ONLY to external thread faucets, it designed to fit behind your shower head like on the pictures. Your pet is going to LOVE this shower massage that helps eliminate scratching and biting. ✅[ELIMINATE STRESS]:It gives you total control over your pet and the flow of water during the entire bathing process, eliminating much of the time and fuss involved in bath time. Save time, reduce the mess, and eliminate the stress of bathtime for you and your pet with this pet shower. ✅[HIGH QUALITY& SAFE MATERIAL]: Different from the traditional harsh rubber glove，this one is made of high elasticity silicone, silicone tips provide gentle relaxing massage and it is more durable. Our accessories' parts are made of polyester fiber, BPA-FREE food-grade silicone, sturdy plastic, ABS, and metal.